Horsemanship Safety offers a defensible, systematic approach to teaching horsemanship safety. Do You Have A Program That Teaches Students, Step by Step, How To Stay Safe In the Saddle? We Do! HS offers an efficient and tested method for training instructors and trail guides and for teaching riding. It is the only method designed to teach one person how to teach another person to ride – English or Western. Do You and Your Staff Have the Knowledge Needed to Best Protect Yourselves and Your Facility from Accidents and Possible Litigation? We Do! Horsemanship Safety is a non-profit, educational association founded in 1995. It answers a need for riding instructor and trail guide certification that relates personal skills to safety and helps insulate instructors, camps, stables and guest ranches from liability suits. AAHS offers a defensible, systematic approach to teaching horsemanship safety. Can I Attend a Certification Clinic? The main focus of the instructor clinic is HOW TO TEACH, not how to ride. However, each candidate must take a riding test on a beginner level horse. Once they've gone through the Secure Seat (TM) workshop portion of the clinic, most participants claim that their riding has improved by the end of the clinic. People wanting non-riding certification do not have to ride. There are also written tests and a practical teaching test during the last days. We also focus upon equine liability and negligence law, facility management and program design. Intertwined in everything is SAFETY. 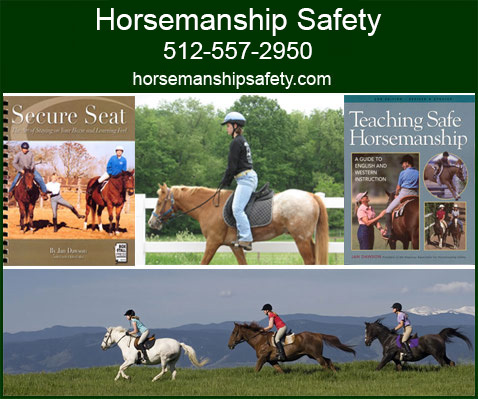 Our handbooks, Teaching Safe Horsemanship and Secure Seat, have been commercially published and have received rave reviews throughout the industry. Teaching Safe Horsemanship is recommended reading for United States Dressage Federation Instructors and other programs. We also have the most content rich, equine law web site in the industry. The law web site gives AAHS its strong legal base. All of our clinicians are professionals and most have impressive competition credentials. They come from several different equestrian backgrounds including: competitive trail riding, hunter/jumper, western pleasure, reining, therapeutic riding, and dressage. Each clinician is a competent multidisciplinary rider who believes that correct basics are not discipline specific. There is only one way to sit on the horse and be in balance and you are either in balance or not. We have different types of certification but we do not call them levels. At AAHS, one is either considered trained well enough to be left alone in an arena or on the trail with a group of riders, or not. We do not say an instructor or trail guide is more or less responsible or is of one level or another. Our Instructor Basic and Full Instructor are distinguished primarily by age, riding ability and experience. We also have a certification for non-riding supervisory personnel, such as camp directors or guest ranch managers, or any person who must be able to walk through an equestrian facility and recognize if proper standards are being followed. What Types of Certifications AreAvailable At Horsemanship Safety? Must get an 80% on the exam including 100% on the Secure Seat skills section. Has passed the exam with a score of a least 75% . Is able to write a lesson plan suitable for pre-ride instruction. Want To Host A Certification Clinic at Your Barn? Horsemanship Safety will send a certified clinician to the facility. Each clinician uses the standardized AAHS curriculum which includes the 2 required texts, Teaching Safe Horsemanship and Secure Seat, and a clinic packet of information not covered in the books. Trail Guide or Equestrian Safety Supervisor only clinics may be shorter and have less requirements than the 5-day instructor clinic. Call or e-mail the AAHS office for our Hosting Information packet. Make Sure You Have Our "Secure Seat©" Book! At only $15.95 it is GOLD for anyone seeking to instruct riding students-- or for any horse person wanting to become a better rider themselves! Actual PROVEN "step by step" instructions on how to develop the most balanced and secure seat possible- and thus the safest possible experience on your horse. What Does InfoHorse.com Say About The Secure Seat Book? I have read many books on horsemanship and riding. When I heard of this book and had it sent to my office, I was certain it would contain many helpful tips. What I was amazed-- and thrilled-- to find, was that it was actual STEP BY STEP information on how to keep your seat!! I couldn't put it down. I found myself wishing I could call every instructor and rider on the planet-- and persuade them to read it. It was like a revelation-- so well written, so easily understood, and a MUST for instructors, trail guides, wranglers-- or those who have lost their confidence in riding-- PLEASE buy it-- READ it-- LIVE it... and you'll never regret it. I give this book FIVE STARS! Don't Wait for a Lawsuit or the Heartache of an Injured Student or Client! Call Today! If teaching riding is your business, and if you are an instructor, trail guide, horse vacation wrangler or just want to be a better rider yourself, nothing can prepare you for success in safety better than the American Association For Horsemanship Safety. We believe everyone should be able to defend what they teach and do at their facility. Invest in yourself and your staff today! We are worth every dime-- you'll never regret it-- and your students and clients will benefit tremendously. Remember: In preparing to avoid accidents you are preparing to avoid lawsuits! Call Jan Dawson Today!